The Guide to Get Rich: Creative Thinking Adds Cash Flow!!! Creative Thinking Adds Cash Flow!!! The book of the week was Real Estate 101 by Gary Eldred. The book comes from the Trump University series of books. I love real estate investing because it makes sense in so many ways. There is nothing new about real estate investing. It has made numerous people very wealthy and still is making people rich today. Okay... sure... there has been a lot of people broken by real estate investing too. But it's because they did it wrong. It's people like Eldred and Trump that teach beginners how to invest the right way and how to not lose their shirt. Eldred likes to look at real estate from an entrepreneurial mind-set. And when I say entrepreneurial I mean being creative in an effort to make profit. So in terms of real estate, you would use that creativity to add value. You can use creativity to market your property using segments, find where your real estate area is headed, and add value to maximize cash flow of your property. Marketing your property is very important to attract the 'right' type of tenants. There is nothing worse for your real estate career than allowing the 'wrong' people to lease your properties. So how do you get the 'right' person? Well first you have to decide who you want as a tenant. Do you want a college student, a young professional, a retiree, smoker, non-smoker, married, male or female. Once you decide you can start flushing out your strategy for marketing. Being specific is very important. All too often VALS (Values and Lifestyles) are broken into too broad of categories. For instance, there is an obvious difference between different types of college students, but more often than not, an investor will say they avoid renting to "college-students." Well I know from experience that not all college students are the same. In college I treated a property much differently than the cast of "Animal House." So... for our marketing and property purchasing let's pick a quiet, non-smoking, female, college student with good grades.... What does she want? Since she is quiet, she will appreciate a place that doesn't have noisy neighbors or paper-thin walls, so buy a place that is nicely isolated and has a strictly enforced quiet hours policy. She doesn't smoke, so we can dictate our leases have a no smoking policy. Being female, she will appreciate security, so you should buy in a safe area, have lots of great lighting and market the proximity to a police station. And you want a college student, so you should purchase a property near a college (duh) and she has above average grades, so (coupled with the fact she is quiet) she probably doesn't need to live next to all the bars in town. These are all stereotypes, but if you use them, you are more likely to attract the tenant you are searching for and the types you aren't looking for will search elsewhere. The "Animal House" crowd isn't real big on living in a place the evicts tenants for getting too loud after 11pm, so they won't even consider living in your complex. When looking for a property it's not always a great idea to look where there is hype. When you go to the place of speculation, you lose sight of the goal (cash flow) and are more focused on the hype and competition. Investors in these areas will purchase a property that will give them negative cash flows with the expectation the market will turn around and make them boat loads because "they heard so." If you want to cash flow a property, just look in your own backyard. You know the city you are live and you know where the nice areas are. Right now there are tons of properties for sale. It is a buy's market! Everything is hugely discounted so you have your pick of the liter. When you are looking in your city for the best property you should look at where the different neighborhoods are going. You may find a great deal on a house because that neighborhood is dying and not being kept up. That neighborhood could suffer in the future years and your rental rates will have to decrease to keep tenants. It is not good to lose money on a property after you have been cash flowing the 5 years previous. However, the converse can also happen. You can analyze an area that is being heavily developed with nice shopping and restaurants. In that case you might see a cash flowing property increase it's return greatly after 5 years because the area has developed into what might be considered "high-end". If you are investing in your own city you should be able to see the trends. Keep your eyes and ears open for what areas are growing and take advantage. Of course investigate all claims and add common sense. Don't turn into a speculated investor that thinks that if you take a cash flow loss for 5 years, you will be making oodles in the 5 years after.... Just keep the goal of positive cash flowing in mind. The best way to use your entrepreneurial creativity is to add solid cash flowing concepts to your property. There are a many ways to do this, but a couple popular ones include: adding coin-operated laundry, for-rent furniture, and for-rent storage areas. This is a great opportunity to bring dead space to life within a property. Take that larger extra maintenance room and transform it with several two by fours and ply wood into about 20 storage units that you can charge tenants an extra $20 a month to rent out (that would be an extra $4,800 a year in cash flow). If you have a large population of young professionals, add a pick-up and drop-off dry-cleaning service (using a local dry cleaner... a lot of dry cleaners will even do the pick-up and drop-off for you) and add an extra $5 service fee (if you are able to get 20 tenants a month to take advantage of the offer you add an additional $1,200 in cash flow). Both of these ideas didn't take hardly any effort on your end and both have potential for great EXTRA cash flows. The great thing about real estate is that everything that can be done to initiate extra cash flow has been done already. Just do a little research on what other places are doing and replicate it. This book has a lot of additional concepts that are a little too dull to address tonight, but if you like what I have written so far, I suggest you pick it up. 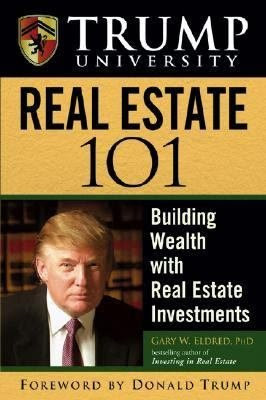 I don't think you would be ready to invest in your first investment property with just reading this book, but I do think it's a valuable addition to your investment arsenal. If you have any questions on the book don't hesitate to ask. I would be more than happy to help anyone that wants it. Conspiracy or Not... Something is Wrong!